Hogman, I have one I bought this year, going to try it next week at Hagerman. I'd be cautious using it in an area during a firearm season, or maybe thats just me. And what are you drink-n tonight? Cheers! I guess if the deer are walking around looking up in trees (for hunters like they sometimes do), and your sit-n on the ground, that'd give a person a chance to draw on one. TG, you really need to change that Avatar. Hunters pull into parking, see 10 hunters in trees with bright orange vests, move to next unit. Works every time. And, I wish I was drinking something. At least then I would have an excuse. I'll be heading out around lunch today, maybe the weather will have them up and moving this evening. Hunted a new spot yesterday am. Had a spike at 5 yards and some pigs out front. Hunted a different unit around 10am and saw a 2 year old buck at about 70 yards cruising. Didn't respond to grunting. Saw a nice buck chase a doe onto private while I was getting ready for the evening hunt. Hunted a new spot yesterday evening. Bumped a little buck walking in, saw a 4 pointer, spike, 3 does (one walked right under my tree) and the big 8 pointer I have pics of right at the end of legal light (see attached pics). He came to about 60 yards. I was disappointed I didn't get a shot but exciting to see him. I've still got bow in hand so I godda get real close. Came back to same spot this am and saw a nice buck with a doe in the same spot as the buck from last night. They were there for a few seconds and then off. I grunted with no response. Checked a camera on the other side of this unit and the crab claw buck was at another spot I hunt last night... All good, hope to get on one before I leave Sunday am. Sounds like their getting serious about the rut. Good luck. Shoot that 8. Congrats on the 8 pointer. Were there still acorns on the ground up there? Hey IkemanTx, would you mind terribly PMing me a little info on the Oklahoma bow hunting? I live in North DFW so not too fat of a stretch to get up to a couple WMA's if it's worth it. No specifics or honey holes just good solid info. Price of licenses, special/abnormal regs type stuff. Not many... a few of the red old (blackjack) had some under them. I did get into a few chinkapin oaks this week, which surprised me. They still had a few dropping. He would be a nice one to get down. Good luck finding him again. Hopefully he will cooperate for you next time. Sorry IkemanTX, couldn't reply to your PM because of my limited posting to this point. Thanks for the great info! Quick question guys. Is there a classified section for hunting leases on TBH? There is not a dedicated section to Leases. In the classifieds, there is no dedicated section to anything via TBH. Although a few have tried to dedicate some threads to some subjects in the classifieds just like some subjects in Around The Campfire forum. Around the Campfire did have a thread in it the last two years, for leases, that members started and kept up. Last edited by Texas Grown; 11-10-2018 at 08:57 PM. Shot a pretty good buck Friday night with my bow. Waited until Saturday morning to track. Found arrow and tracked good blood for about 150 yards and then it dried up. He could have gone many different ways. Sent a few texts for tacking dogs but no response. I'll be back out Sat to see if he's still running around or get on another one. Hopefully he made it. Hit him between the guts and hind quarter. I've never shot a deer there before. Complete pass through. Blood coming out from both sides. I was hoping I hit the femoral artery but I don't think he'd have gone 150+ yards if that'd happened. It's really starting to heat up out there. Sorry to hear that, brother. Happens to all of us.... or will. But if you would have hit that femoral artery, you’d watch it drop in sight. Hate that for you man. I hit one two Fridays ago. I shot, he ducked and lunged...hit him in the ham. Not much blood and only for about 10 yds, then nothing. I saw him run off after the shot and the arrow did not pass through. Put in a thorough search. Been back out 3 times since. Alerted the neighbors next to that unit. Told another hunter I met who hunts that unit. No buzzards. No word about a carcass from the neighbors or hunter. I think he made it. He was 1x3. Still on quest for first public land deer with bow. Sorry to hear that Troy. Was it watery blood or deep red? Watery may have been stomach. If there was browse or grass on the arrow may have been intestines. If high enough may have not hit any vitals but I expect it hit something if there was a lot of blood. Dang. You sitting field edges or back in the timber? Finally got it done on LBJ. Got off work Monday morning and headed out. Got out there at about 8am. I found an empty unit that I haven’t hunted before and started scouting. The deer were up moving really well all morning. Found a really good area with some very fresh buck sign. I ended up following a scrape line until there was a small opening with a trail through a thick briar patch. I decided to give it a full send and belly crawled through the small opening. Whe I got to the other side the area was littered with fresh side and even just smelt like deer. I used some dead fall to create a small blind along with a few bushes surrounding a clump of trees. It wasn’t 20 minutes later that I saw this buck 50 yards away. He was making fresh scrapes and grunting up a storm. Stayed within 50 yards of me with no idea I was there for 30 minutes and the made the wrong turn down the path leading to me. 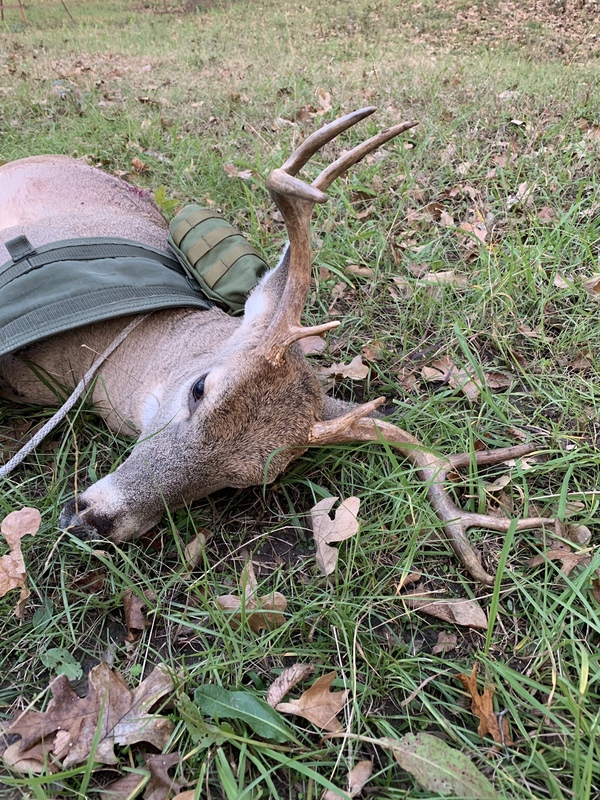 Shot him at 15 yards. Hadn’t had a chance to sight in the new scope on my slug gun and issues with my bow put me using buckshot out of my duck gun. It did the job and he only made it about 20 yards before stopping. I new it was a decent hit as he stumbled several times just to cover that 20 yards. It took me about 30 minutes to really process everything and calm down enough to go over to him. A pretty nice public land buck and my first ever buck. Dropped him off to be processed at Cutting Edge Processing and caped for the taxidermist. Going to get a shoulder mount done on him. 8 points with a cool little bent over point on the right side. Looks like he injured it while in velvet. Congrats on the buck. Interesting that many places had too much wind yesterday but there were pockets of activity. Good job. I've got a turkey gun and I have half a mind to get some buckshot. First buck ever? and on public land?? Hats off to you. Nice going. Killed many a deer with buckshot out of an LC Smith 12 gauge side by side. Fine shot on one side for turkey, buckshot on the other for deer. Broke their necks. Good times. I saw where you were asking about Oklahoma hunting info. I have a lease in Northern Oklahoma. Not sure on WMA hunting but for Non-Resident Archery its $300. That's a good buck, congratulations! That wind today is making things pretty chilly. It just cuts right through you. Yes sir I was up in the trees. Ended up laying eyes on a small buck. Spike winded me before I could get an arra off. All in all it was a fun day. Yeah I did not see anything. Was moving around quit abit to try and find some recent sign. Found a new spot. Going in tomorrow to hang 15 ft ladder to stand it hunt out of the next few days. Found a couple of fresh rubs and a ground scape and about 9 wood ducks back in the creek. Should be interested. Good job Rich. Now we can ge to the real task at hand. Getting out with Archer and getting those quackers! Started my scouting this morning. Wow do we have a lot of water right now. Some of the areas we used to hunt that haven’t had enough water the past few years might now have to much water to hunt in. Searching for some new areas. Might also try to go fill some doe permits in the National Forests. How many ft/yards are we supposed to be hunting from private land? And what's the best way to contact land owners should a deer jump onto private? Just call the game warden? I believe it is 150 yards from all roads, designated trails, or forest service boundaries. If game crosses a property line Just contact the game warden. Controlled burns starting today through Sunday in units 31, 30 and 74 near Tandra Point. You seeing them run around your place at all? I usually don't see the bigger ones in daylight. I have seen small ones and spikes harassing the does though. I need to go check my cameras, as the rut is when I get the big ones on camera. 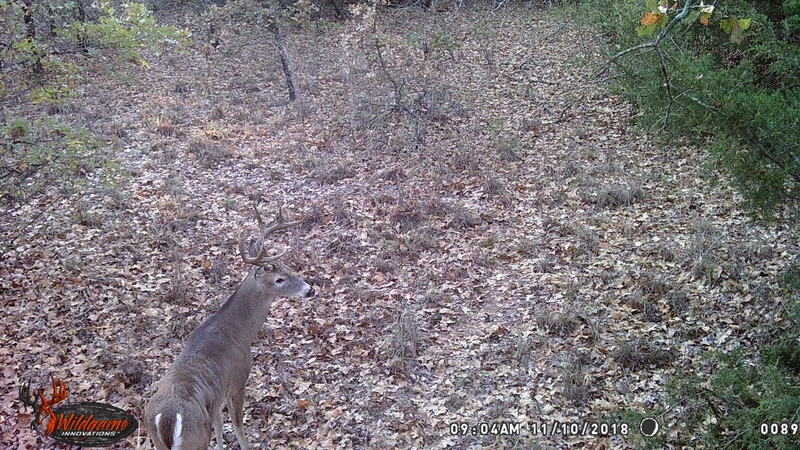 May have lost a camera in the burn lol I didnt realize they would burn right in the middle of deer season. Guess I will see when I get back in town.